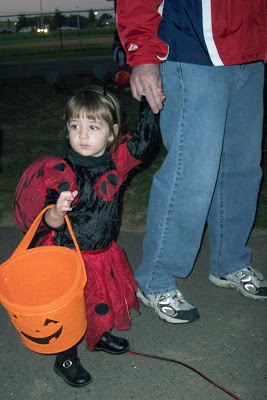 Here’s more of her trick-or-treating at Trail of Treats last night. For those of you who don’t live in Murray: Trail of Treats has different organizations + people set up around a trail at the park so the kids to trick-or-treat. It was Cate’s first time, and she eventually got the hang out of it. 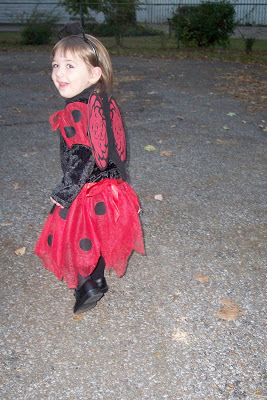 Although instead of saying “trick or treat,” she just said “please” and “thank you.” Works for me. 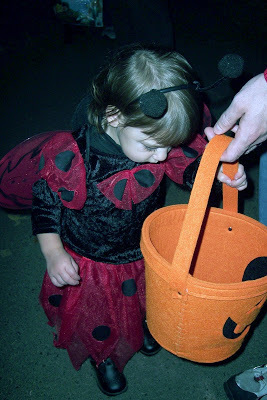 There she is (above) checking out the candy someone tossed in her pumpkin. Cate can thank Grandmom for that pumpkin, which came in the mail the other day filled with 100 gummy candies from Sam’s Club. It worked well for trick-or-treating. 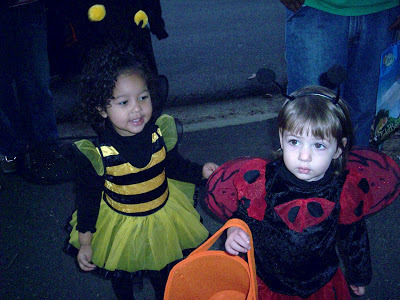 Doesn’t Malaika make a cute bumble bee? And, no, Kayla and I didn’t plan to coordinate our girls’ costumes. They looked cute together though! 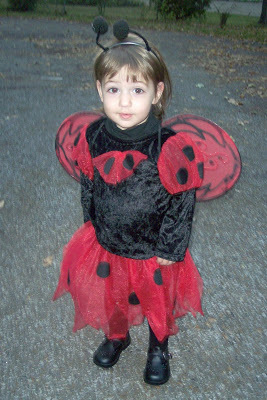 I love her costume… wanted Madelyn to be a ladybug to match Annie…she wasn’t going for it!